As recalled in the Joint Statement on Aviation and Tourism: Hand in Hand for Sustainability, signed on March 18, 2013, and in the Medellín Statement on Tourism and Air Transport for Development, adopted on September 14, 2015 by the International Civil Aviation Organization (ICAO) and the World Tourism Organization (UNWTO), air transport and tourism are major contributors to global economic prosperity, generating numerous socio-economic benefits and spin-offs. The increased connectivity that air transport delivers is at the heart of tourism development and leads to further investment in both sectors. It creates a healthy cycle of economic development in those countries and regions which set out suitable planning and investment commitments. In 2017, a record of 1.3 billion tourists crossed international borders, approximately 55 percent of whom arrived to their destinations by air. In the same year, airlines worldwide carried around 4.1 billion passengers with 7.7 trillion revenue passenger kilometers (RPKs). The total number of international tourists is expected to reach 1.8 billion by 2030 while air traffic volumes will double in the next 15 years. 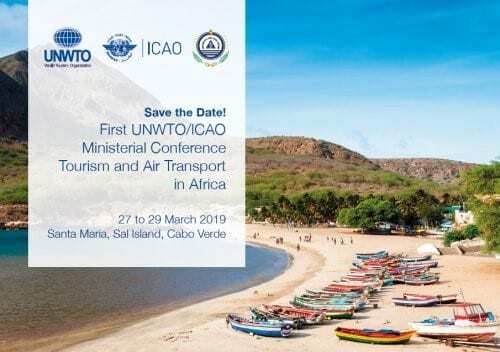 The symbiotic relationship between aviation and tourism is reflected at the global level in the respective mandates of ICAO and UNWTO. ICAO sets standards and policies for aviation safety, security, efficiency, environmental protection and economic development of air transport. UNWTO promotes responsible, sustainable and universally accessible tourism as a driver of economic growth and sustainable development, offering leadership and support to the sector in advancing knowledge and tourism policies worldwide. Tourism has become one of the fastest growing economic sectors in the world. It is a sector that accounts for one in every 10 jobs and contributes 10 per cent to the world’s GDP (gross domestic product). Particularly for Least Developed Countries (LDCs), Landlocked Developing Countries (LLDCs) and Small Island Developing States (SIDS), tourism is often one of the main economic activities which, due to their location, coupled with exceptional natural and cultural resources, these countries have a strong competitive advantage. Tourism has also the ability to generate significant amount of foreign exchange earnings, spur infrastructure investment, boost competition, and stimulate other economic industries. Additionally, it is widely recognized that a good part of foreign exchange earnings do trickle down to different groups of a given society. When tourism is managed with a strong focus on poverty alleviation, it can also have a strong positive impact on reducing poverty levels through employment of local people in tourism enterprises, goods and services provided to tourists, or the running of small and community-based enterprises, etc. Consequently, tourism is widely regarded by many experts as the most viable and sustainable option to promote broad-based economic development in many countries. Aviation provides the only rapid worldwide transportation network, which makes it essential for global business, and consequently for high revenue travel and tourism. A strong and affordable global air transport network transcends continents, greatly expands local access to foreign supplies and markets, provides invaluable opportunities for cultural and social exchange and enhances emergency and humanitarian response capabilities during crises and public health emergencies. Air transport generates economic growth, creates jobs, and facilitates international trade and tourism. The total economic impact of the aviation industry is some 3.5 per cent of the world’s GDP, USD 2.7 trillion, which supports 62.7 million jobs worldwide. Through a synergetic relationship, aviation supports over 36 million jobs within the tourism sector, contributing roughly USD 892 billion a year to global GDP. Tourism-related GDP is projected to grow 4.0 per cent annually over the next 30 decades, compared to 2.7 per cent estimated growth of global GDP. Both tourism and air transport sectors directly and indirectly contribute to the attainment of the United Nations’ Transforming our World: 2030 Agenda for Sustainable Development, including the Sustainable Development Goals (SDGs). For example, SDG Target 8.9 calls on governments to devise and implement policies to promote sustainable tourism that creates jobs and promotes local culture and products by 2030. SDG 12 b on the other hand stresses the need to continuously monitor and evaluate the impact of tourism on the communities. Africa has undoubtedly a huge tourism and air transport growth potential that remains untapped. Although some African States are too small or remote to achieve structural transformation through industrialization (i.e. achieving higher levels of added value in manufacturing), they have significant unused natural and cultural tourism potential and opportunities in the area of trade in services by air. The Continent, with its natural resource endowment and its authenticity and originality as a destination, is well positioned to reap more value from tourism activities. However, this potential has yet to be translated into real tourism and air traffic growth. Indeed, the region has not yet managed to attain access to the global market on a scale that would enable tourism and air transport to be effective forces of development, commensurate with their recognized potentials. The number of tourists coming to Africa, especially by air, is still relatively low compared with other regions of the globe. The number of international tourist arrivals expressed in percentage of the population in Africa is 5.4 arrivals per 100 of the population, compared to 14.7 per 100 of the population worldwide, or 59.2 per 100 in Europe2. Due to the fact that the tourism sector in Africa is highly dependent on air transportation3 and the availability of air transport services is limited in comparison with other parts of the world, tourism growth has suffered as a consequence of air transport limitations. Most airports in African States, especially LDCs, LLDCs and SIDS, receive only a limited number of flights per week; costs of air travel is likewise judged to be disproportionally high both for intra-Africa flights and for international flights to and from Africa. The African population, which represents about 15 per cent of the world’s population, is catered by only around 4 per cent of all scheduled air service seats in the world, compared to 27 per cent in Europe, which has 11 per cent of the population of the world. The uncertainty about continuation of air services might have an adverse effect on a travel industry’s inward investment and the opportunity for inbound tourism, and thus the actual loss of a service could have a much greater cost. Without reliable, attractive air services and harmonized aviation and tourism policies, the benefits of aviation and tourism simply cannot be realized or are constrained at best. President Ramaphosa of South Africa is a “Travel & Tourism job creation champion”, according to Gloria Guevara, President & CEO of the World Travel & Tourism Council (WTTC). BANGKOK, Thailand - The Tourism Authority of Thailand (TAT) has overhauled marketing plans to cope with a tourism slowdown and some flight reductions by Thai Airways International (THAI) in Europe.